The library is in many respects the intellectual and academic centre of every university campus. The George A. Rawlyk Library of Crandall University, named in honour of the late Dr. George A. Rawlyk, History Professor of Queen’s University, is no exception. Dr. Rawlyk was a friend and contributor to our University, donating much of his personal library. Students are encouraged to familiarize themselves with the available services and resources as part of their academic experience at Crandall University. The card catalog for the Rawlyk Library is available online and can be accessed from anywhere. The Library also subscribes to several article and research databases, which are accessed individually. Each database contains a variety of journals across various subjects, allowing students to access scholarly content from a wide range of sources. To obtain login information for the research databases, current students may visit the library or speak to course instructors. Students and community borrowers may sign out books during library hours for a period of fourteen (14) days. A person may borrow up to ten (10) books at one time, keeping in mind that the collection is to be shared. Library cards with photos must be presented for borrowing privileges. They are issued at the beginning of each semester for new students and by appointment for community borrowers. Cards are validated annually. Replacement cards are issued at a cost of $15.00. Returns and Fines Books must be returned to the circulation desk on or before the due date stamped on the back cover of the book. After this date, a daily fine of $0.25 per book will be applied until such time as the book is returned. If a book is lost or damaged,the borrower is charged the replacement value of the book or $30.00 if book is out of print. Final marks are not released to patrons with Library fines or books. Renewals Books may be renewed in person or by phone. The phone number at the circulation desk is (506) 858-8970 ext. 171. Books in the Rawlyk Library are classified according to the Library of Congress Classification. HISTORY OF AFRICA, AUSTRALIA, NEW ZEALAND, ETC. On the second floor is the Stuart E. Murray Memorial Collection primarily made up of circulating theological and philosophical books. Dr. Stuart E. Murray was the President of Atlantic Baptist College from 1966 to 1980. Named in honour of Earl and Millie Morrison, this circulating collection of educational resources in Room 147, first floor, owes its existence to a $50,000 project to develop a complete learning resource centre. Fred Cogswell (1917-), after whom this non-circulating collection of books in Room 158 is named, is a noted Maritime author. Consequently, much of the content is Maritime or Canadian in nature. Cogswell taught at the University of New Brunswick from 1952 to 1982. From 1983 onwards he has been Professor Emeritus. The non-circulating books from the estate of George A. Rawlyk (1935-1995) are found in Room 158, first floor. Rawlyk was a History lecturer at Mount Allison University from 1959 to 1961. Subsequently, he taught at Dalhousie University (1963 to 1965) and at Queen’s University (1966 to 1995). The books in the collection deal primarily with Canadian and religious history; however, theses that he supervised are also included. Two readers are available for reading microfilm and microfiche. Interlibrary loan services are available by filling out the relevant form that is available at the circulation desk. To facilitate the request of library items, the National Library of Canada has made AMICUS available at no cost. 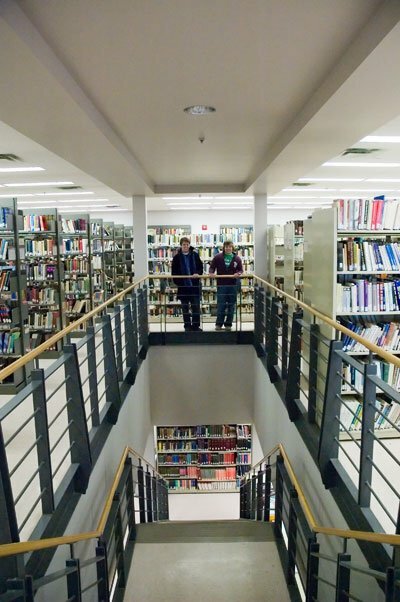 AMICUS is an online database of holdings from over 500 Canadian academic libraries. Searches from this database may be conducted according to the instructions outlined at each computer terminal. It should be noted that a processing period of one to three weeks is required for all interlibrary loan items requested. Most borrowing periods range from two weeks to a month, depending on the loaning institution. Loans from within the Maritimes are generally free, but libraries outside the region charge. Information regarding charges for this service is available upon request. The following guides can be used as a reference when formatting research papers. Consult with your professors regarding their preferred format for assignments. Additional help with formatting can also be found at the Student Success Centre.